In an exclusive behind-the-scenes interview, program producer Grant Sonnex reveals the secrets of putting together Song of the Earth. 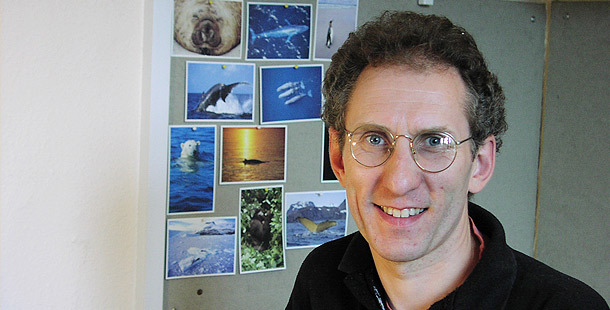 A media professional for twenty years who began as a sound engineer, Grant is currently a radio producer for the BBC’s Natural History Unit. NATURE spoke with Grant in March, 2002. Song of the Earth producer Grant Sonnex. How did this project come about? I made a radio series with David Attenborough a few years back about nature’s use of sound in general. One of the programs was about animal song, and it kind of ended with a question: What could be the connection between all of this going on in the animal world and human music? And this was the question I tried to find an answer to in the program. And having produced the program, what do you think about the connection between animal and human music? People think of human music as being a cultural construct, but with any behavior that you find in humans in every culture all around the planet throughout history, chances are there’s more to music than pure culture, that it goes back to some kind of biological root in the end. I think there’s no doubt that human music has its origins in biology, and I tried to explore the details of this in the program. For example, we all know that animals use song territorially, and you can easily see examples of humans doing that with national anthems and songs in sports stadiums where teams or fans are essentially announcing: “We’re different than you, we’re stronger and better.” As far as using music to attract mates, you definitely see birds and whales engaging in this. One might link this to human’s use of romantic love songs — think about why many thirteen-year-old boys take up the guitar and then start playing them in places where lots of girls hang out. There’s a fine line between what one might call animal sounds or noises versus actual song or music. How do you differentiate the two? If you’re not careful, you start getting into just the semantics of the issue. But in general there’s a fairly clear distinction between a grunt that says, “I’m hungry” or any noise that carries a single piece of information and then the other extreme of complex bird song, full of frills and ornamentation. With bird song, it’s clear that it’s not as though each element in each song carries a different message; rather it’s the overall impression and emotional feeling given by the entire song that determines the meaning. And that’s the distinction that I’ve observed. How did you go about finding the scientific researchers featured in the show, like Katy Payne, Graeme Lawson, and Bjorn Merker? Well, after the initial radio program in which we posed the question that became the basis of the show, I thought to myself that we’d just find the best people in the world who know about the connection between human and animal music, and we’ll find the answer. The truth is, there aren’t that many people studying the origins of human music. But while no one is pulling together all the threads into one coherent story, there are a lot of people whose work impinges or is tangential to the issue. So I found that the research for the program was much more a case of developing a thesis and then testing it against various people’s work in the field. Sir David dives in to discover the songs of underwater mammals. In terms of people like Bjorn Merker, the researchers working in this area tend not only to be good scientists but scientists with heart. The people want also to explore the emotional responses that music provokes as well as the scientific evidence of how animals are behaving. They’re passionate people who are fascinated by their subject. David Attenborough is such a legendary television presenter. What was it like working with him on this program? He’s a consummate professional and very entertaining. You can’t have traveled around the world as much as he has without being full of stories, and he regales you with those at every dinnertime. And of course, he’s very game for anything; at one point he actually got into the water to hear the whale songs for himself. Also, as music is at least as great a love for David as nature and animals, the program was a great fit.